VIENNA—Hundreds of police sealed off part of central Vienna on Monday as Austria became the only western European country with a far-right party in power, but protests against the swearing-in proved small and largely peaceful. 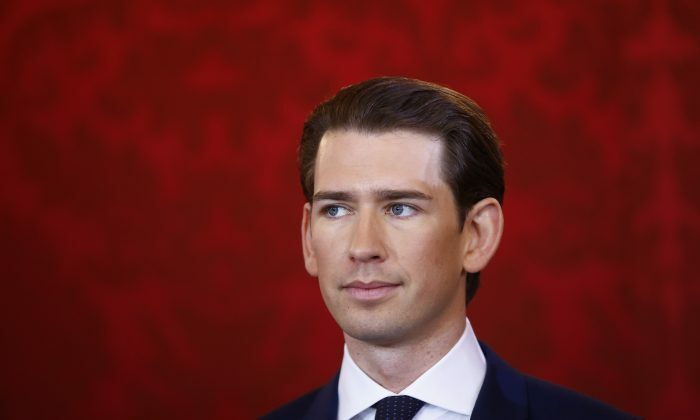 Conservative Sebastian Kurz, who is just 31, became chancellor in a coalition with the far right two months after winning a parliamentary election with a hard line on immigration afterAustria was swept up in Europe’s refugee crisis in 2015. The last time the anti-immigration Freedom Party (FPO) entered government in Austria, demonstrations were so big that the cabinet took a tunnel from the chancellery to the swearing-in ceremony at the president’s office across the street. There was no need for that this time as, almost 18 years on and to a significantly more muted reaction, the country once again became an exception among its peers, but in a very different European political landscape. Protests nearby drew only a fraction of the tens of thousands who gathered in 2000—and criticism from across the continent has also been more restrained. Police wore riot gear and stationed two water cannon at the main protest site. “We will certainly not be going underground to the Hofburg, but rather with our heads held high in the street,” FPO leader Heinz-Christian Strache said earlier in an interview with regional newspapers. He was referring to the former imperial palace that houses the president’s office. This time, police cleared a large area around the head of state’s office, keeping several thousand protesters about 100 meters (110 yards) away in a nearby square. Chants could be heard as the new ministers from the FPO and the conservative People’s Party crossed the street quietly to the ceremony. The coalition deal hands control of much of Austria‘s security apparatus to the FPO, which came third in the election with 26 percent. “Any crime committed in Austria is one too many,” FPO Chairman Herbert Kickl said as he assumed his new position of interior minister. The FPO was also given the foreign and defense ministries. The agreement, which made Strache vice chancellor, includes plans to cut public spending and taxes and curb benefits for refugees. “I fear a total shift to the right, a hardening of the domestic political climate and incitement against outsiders,” said 69-year-old protester Wolfgang Pechlaner. Police said 1,500 officers were deployed. People marched peacefully, carrying placards saying “Nazis out” and chanting “Strache is a fascist”. Police put the number of protesters at 5,000-6,000 and said three arrests were made. Organizers put the turnout as high as 10,000. By late afternoon, the crowds had dispersed. The FPO’s success made it an outlier in Europe in the 1990s when it was led by the late Joerg Haider. Now it is one of many anti-establishment parties gaining ground in Europe. Its allies and sister parties this year entered the German parliament and made the French presidential run-off. Swearing in the government, President Alexander Van der Bellen highlighted safeguards built into the coalition agreement. “We have achieved a clear consensus that (involvement in) Europe or the European Union and continuity in our foreign policy as well as respecting our fundamental rights and freedoms are important fundamental principles,” he said. That was a reference to the coalition having ruled out a referendum on EU membership, and to Austria‘s support for EU sanctions against Russia despite the FPO’s pro-Moscow stance. The FPO, founded in the 1950s by former Nazis, has backed away from calling for a vote on EU membership. It and Kurz’s conservatives want the EU to focus on fewer tasks, like securing external borders, and hand more powers back to member states. France and Germany were cautious about future ties with Vienna. 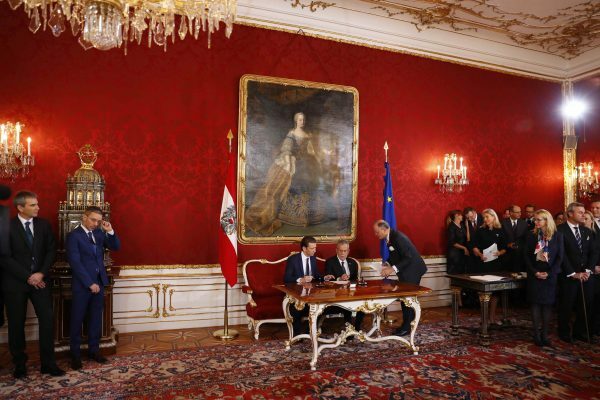 Austrian president Alexander van der Bellen and head of the People’s Party Sebastian Kurz sign contracts during the swearing-in ceremony of the new government in Vienna, on Dec. 18, 2017. Israel was also less than effusive about dealing with a Foreign Ministry controlled by the FPO, which has courted Jewish voters with limited success. “Israel will hold working contacts with the operational echelons of the (Austrian) government departments that are headed by ministers from the Freedom Party,” Israel’s Foreign Ministry said in a statement. Kurz travels to Brussels on Tuesday to meet European Commission President Jean-Claude Juncker and Council President Donald Tusk.